Rheumatoid arthritis is a chronic type of arthritis. 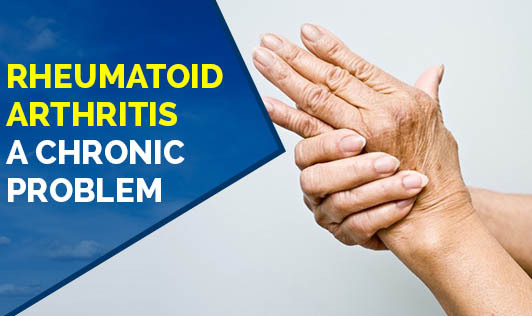 Early symptoms of rheumatoid arthritis include fatigue, joint pain, and stiffness. As it progresses, the symptoms may begin to feel like the symptoms of flu with muscle aches, and loss of appetite. The causes of rheumatoid arthritis are unknown, although there may be a genetic component involved. Early and effective rheumatoid arthritis treatment can improve the prognosis and may help prevent joint pain and bone destruction associated with it. Joint Stiffness: By noting symptoms and seeking early treatment, you can feel better, slow down or even stop the progression of the disease and minimize joint damage. Rheumatoid Nodules: They are firm, flesh-colored lumps that grow under the skin. The nodules grow close to the affected joints. Rheumatoid nodules can be as large as a walnut or as small as a pea. Hand and finger rheumatoid arthritis is characterized by hand and finger pain, swelling, and stiffness. Hand joints and finger joints can also be warm and tender to touch. Knee rheumatoid arthritis causes the joints to become tender, warm, and swollen. Although knee osteoarthritis causes pain and stiffness, joint pain with knee rheumatoid arthritis is more severe. Hip rheumatoid arthritis may show symptoms much later than rheumatic arthritis affecting smaller joints. Heart disease and rheumatoid arthritis: Some researchers feel the inflammation with rheumatoid arthritis may cause higher levels of inflammation in the body. This inflammation triggers the plaque in the arteries to form blood clots. Markers of inflammation such as c-reactive protein are associated with an increased chance of atherosclerosis. When juvenile rheumatoid arthritis affects the eyes: The most common eye problem that can develop in children with juvenile arthritis is uveitis. Uveitis is an inflammation of the inner parts of the eye in a section called the uvea. Vasculitis: It is a general term that refers to the inflammation of blood vessels. When blood vessels become inflamed, they may become weakened, stretched, and either increase in size or become narrow -- even to the point of closing entirely.